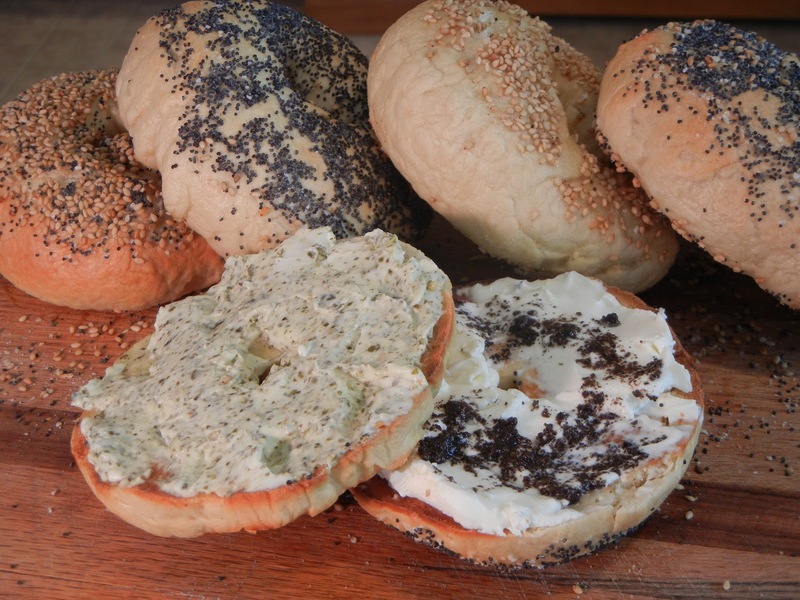 These bagels could change the world. Seriously though what is better than a homemade bagel spread with cream cheese,black truffles or pesto? How about using them to make ham and cheese sandwiches or your favorite morning egg sandwich? As well as saving you some money these bagels are way better than any store bought bagel. Made east coast style as they like their bagels chewier, unlike the softer steamed version that’s most common in many stores. The chewier bagel is made possible by the water method, done by placing the bagel in alkalized water prior to placing in the oven. 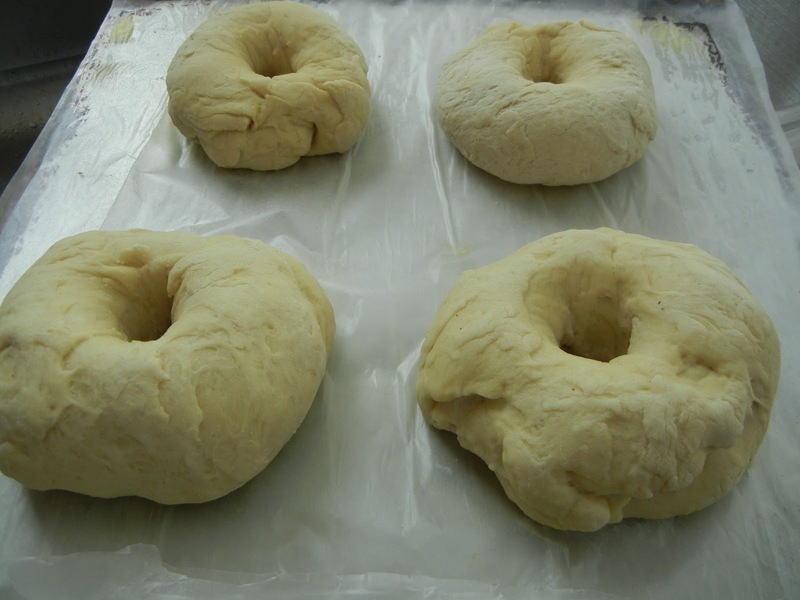 The sponge technique used to make these bagels produces a better flavor and textured bagel as well making as them better for harsh freezing and thawing. You will not produce a memorable bagel without using the overnight slow, cold fermentation which allows the naturally occurring enzymes to release their wonderful flavors. 1. Stir the yeast into 4 cups flour. Add water whisking or stirring only until forms a smooth; sticky batter, almost like a pancake batter. Cover bowl with towel or plastic wrap and let sit out for 2 hours or when sponge is foamy and bubbly. Should double in size. 1. Using the same bowl or your electric mixer bowl, add the 1/2 teaspoon yeast. Stir. 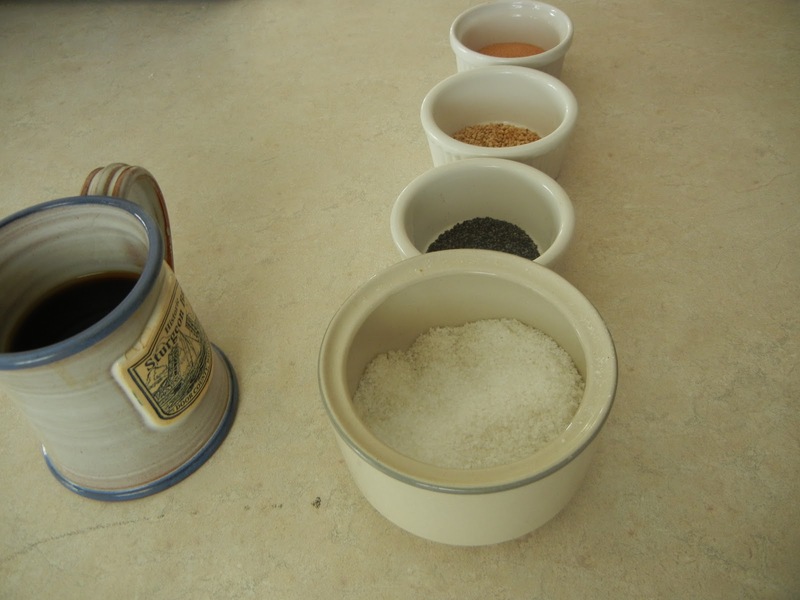 Add 3 cups of the flour and all the salt and malt (Or honey, brown sugar or malt syrup). Stir until the ingredients form a ball. Slowly work in remaining 3/4 cup flour to make a stiffened dough. 4. Cover rolls with a dampened towel and let rest for 20 minutes. 5. Line 2 sheet pans with parchment and mist with spray. 6. Poke a hole in a a ball of bagel dough and gently rotate your thumb around the inside of the hole to make a hole about 2 1/2 inches in diameter. Try to do it as even as possible. 7. Place each shaped piece 2 inches apart on sheet pans. cover with towel or plastic and let sit 25 minutes. 9. Preheat oven to 500 degrees. Remove dough from fridge. Bring large (as wide as possible) pot of water to a boil and then add tablespoon baking soda to the water. 10. Drop bagels in boiling water, after 1 minute flip the over and boil for an additional 1 minute. 11. Remove from water and sprinkle with seeds, (sesame seeds, poppy seeds,salt etc..) or any other flavoring you choose. 12.Once all bagels have been boiled place the sheet pans on the 2 middle racks of your oven. Bake 5 minutes then rotate the pans 180 degrees and switching shelves. Bake until bagels turn golden brown or darkness you prefer. Let cool 15 minutes. Enjoy! 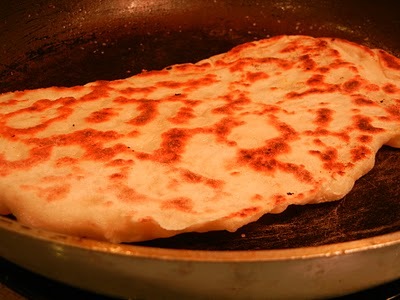 >Naan Bread – Oh, So Addictive!! This naan bread is so so good! Fluffy, slightly crisp and really addicting. If you saved the whey from making your Paneer cheese, use that in place of the water in this recipe. Whey will really improve the flavor of the naan and it give the crispier browned parts on the naan a cheesy flavor. Use this naan to dip into your favorite curry or try out my Butternut Squash, Roasted Red Pepper and Chickpea Curry. 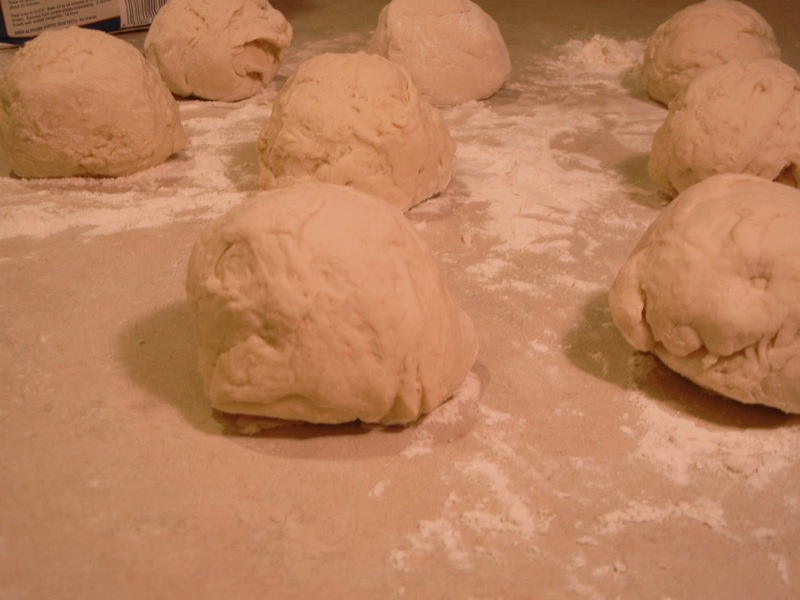 Stir in the flour, salt, oil, yogurt and egg and stir, then knead until you have a soft, pliable dough. Cover with a towel and let rise until doubled in size; about an hour. Cook each naan in a nice hot skillet drizzled with oil (just a teeny tiny bit–you’re not frying it) until blistered and cooked, flipping as necessary. (When the surface has big blisters and is golden on the bottom, flip it over and cook until golden on the other side. Takes about 1 minute per side. Brush with ghee and sprinkle with salt. Tips: When pressing naan out from its final dough ball stage, use your fingertips and press down instead of trying to stretch the dough out with your palms or a roller. The less it’s handled, the better. This vegetable curry dish turned out to be amazing! So full of bursting flavors accented by the perfect spiciness. As for me I love my curries spicy, if you aren’t crazy about the offensive yet satisfying flavor of the habanero, just use the green chilies. Cube the butternut squash into 3/4 inch cubes and sear the outsides in a saute pan with a touch of olive oil at medium-high heat till browned. Sweat onions in saute pan on medium heat till translucent to release maximum flavor. Cut carrots into sticks or cubes and add to pan. Add curry paste, coconut milk, and spices. Stir. 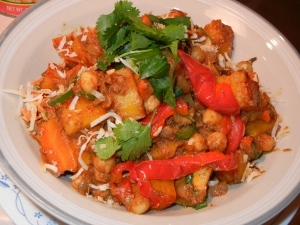 Add squash, roasted peppers, chili peppers and chickpeas. Garnish with cilantro and toasted coconut. Smell it, eat it, love it. First off, I must confess to you all..NO I will not, okay but it’s really really bad… I’m addicted to goat cheese! Whew, that was stressful! I’ve loved goat cheese or often called “chevre” since the second I was introduced to it. I remember losing my goat cheese celibacy when I was working at Taliesin, and we received 6 logs of Montrachet Chevre. The smell instantly reminded me of a farm on a sunny summer day and tasted how a goat would smell. The tasting brought back memories of when I was a small boy and we owned a goat named Brownie. The three things I remember from Brownie were that him chewing up a toaster, him jumping over a fence and how he smelt. I really couldn’t tell you why we had a goat or what happened to him. Hmmm. Maybe my Dad will read this and fill us in on Brownie. If you too are a goat cheese fanatic I recommend trying humboldt fog, bucheron or bucherolle or a goat gouda. From cheaper, whipped goat cheese to the real, stinky goat cheese with the rinds that gives you a taste like no other, they are all very good! Sweet corn and caramelized onions are two things that pair really well with goat cheese, that’s where these tartlets come into play. Try them out and let me know what you think. I thought they were very impressive and packed a huge punch of flavor. 1. 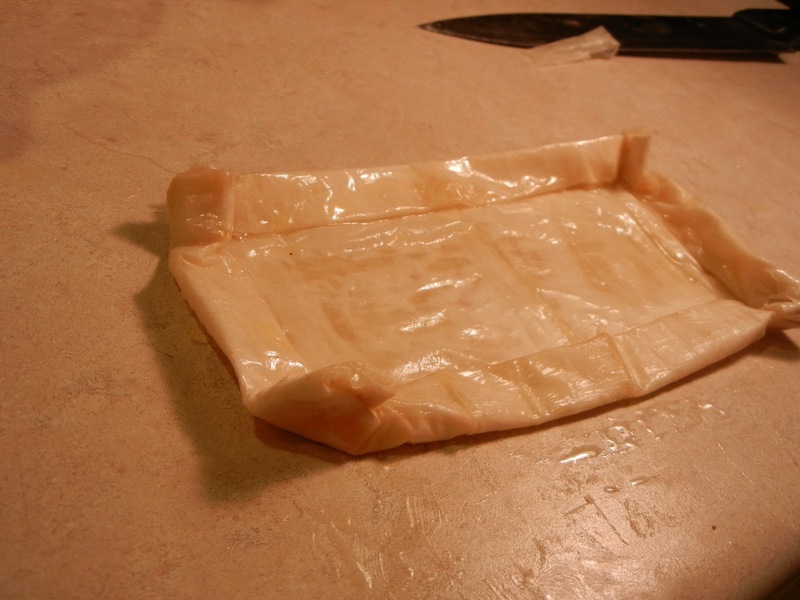 Lay 1 sheet of phyllo on a flat surface. Lightly butter the phyllo with a brush, working from the edges towards the middle, layer 4 more sheets over the first, buttering each one. 2. Cut the layered phyllo into four 6 by 8 inch rectangles. 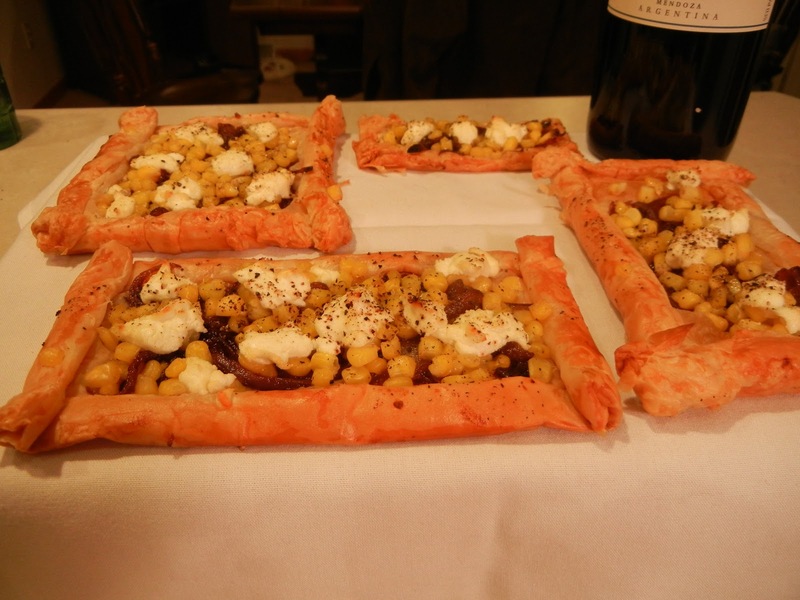 Repeat process with the remaining 5 sheets of phyllo to create 8 rectangles. 4. With two fingers pinch each corner of the tartlets to prevent from unraveling when baked. Lightly brush tartlets with butter and used a fork to poke small holes on the bottom. You can chill the tartlets until you’re ready to use if you’d like. 5. In a saute pan, melt 1 tablespoon butter. Cook the onions over medium heat until they begin to soften up and start to brown. 4 mins. Sprinkle with sugar and continue cooking for 3 mins. Remove from heat, let cool completely. 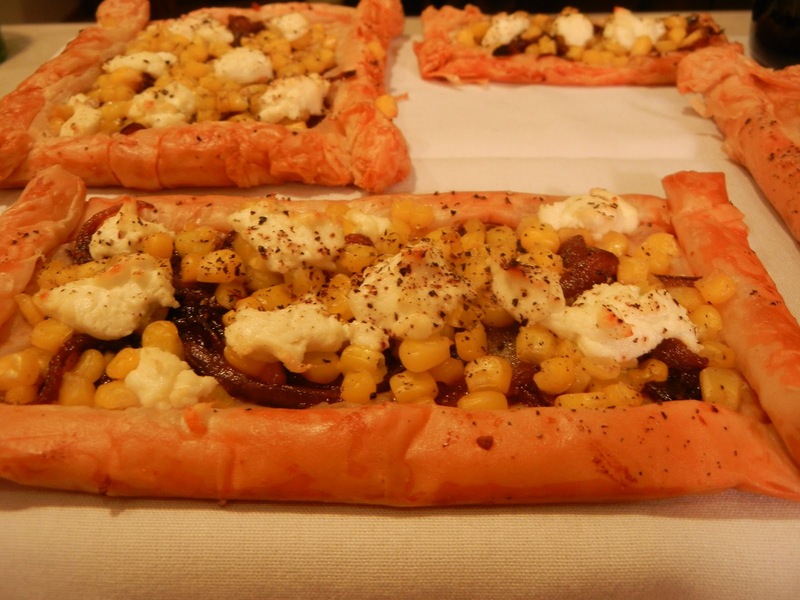 6.Preheat oven 375 degress F. Top each tartlet with layer of caramelized onion, corn, and goat cheese to your liking. Add a touch of pepper, optional. 7. Bake on nongreased baking sheet for 12 to 15 until crisp and golden. 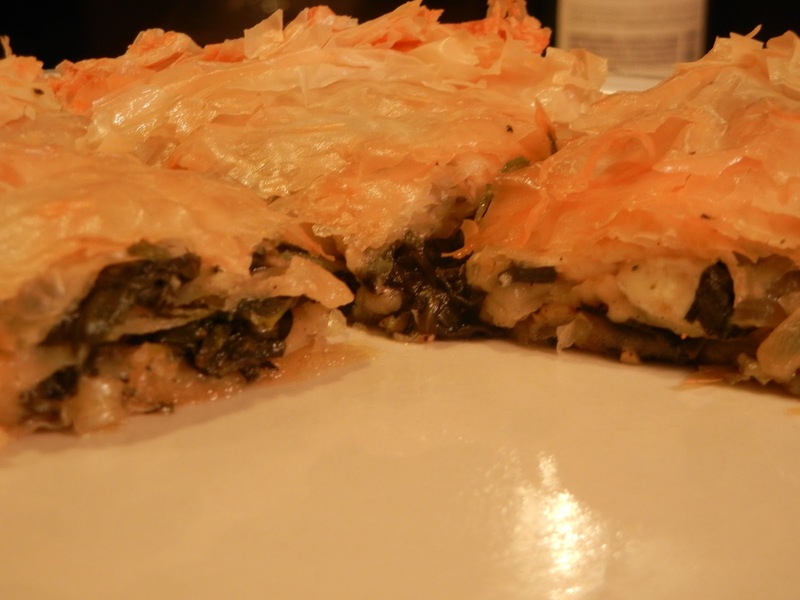 Spanikopita is a rich and savory Greek pastry, layered with spinach, feta, onions, eggs, herbs and good amount of butter, you can see why the Greek eat it as a snack. When feta is not readily available or if your trying to save some money, ricotta can be substituted for feta. Also, I’ve found buying feta in a block is much tastier and cheaper than the crumbled. There are many forms in which you can make spanikopita such as the pie method, rolled up like a jelly roll, napoleon-stacked or in triangles. It is very versatile and you really have to make it to your liking. Can also get creative and replace part of the spinach with leeks, sorrel or chard to create a different palate. I chose to do the pie method this time as I haven’t tried it before. 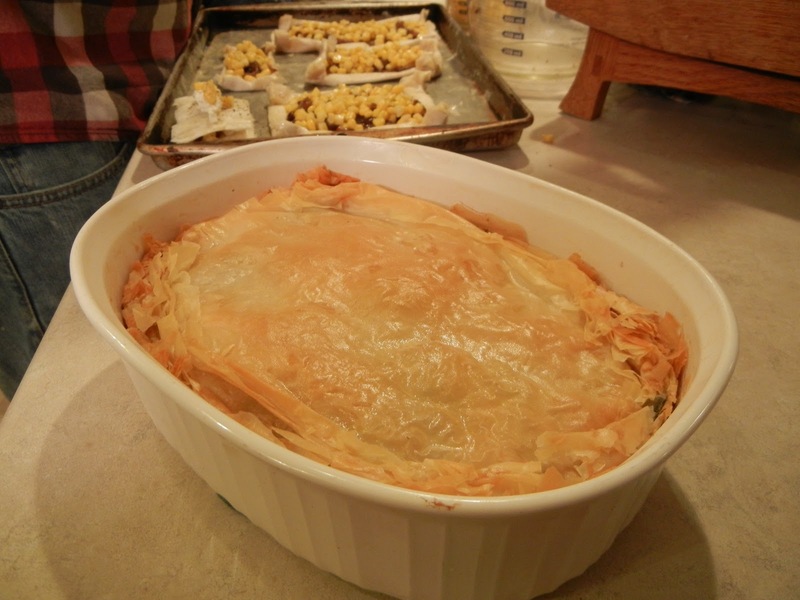 It turned out to be a great way to make spanikopita. Here’s the recipe I’ve formed from different sources as well as trial and errors. Grab a saute pan and melt the 1 tablespoon butter. Cook onion and garlic until slightly browned and fragrant, usually about 2-3 minutes. Add your spinach and cook uncovered until coated with butter and beginning to be more tender. Drain the spinach, Add Nutmeg, salt and pepper. Let sauteed mixture cool completely. Large bowl, add feta, egg, egg yolk, and cream. 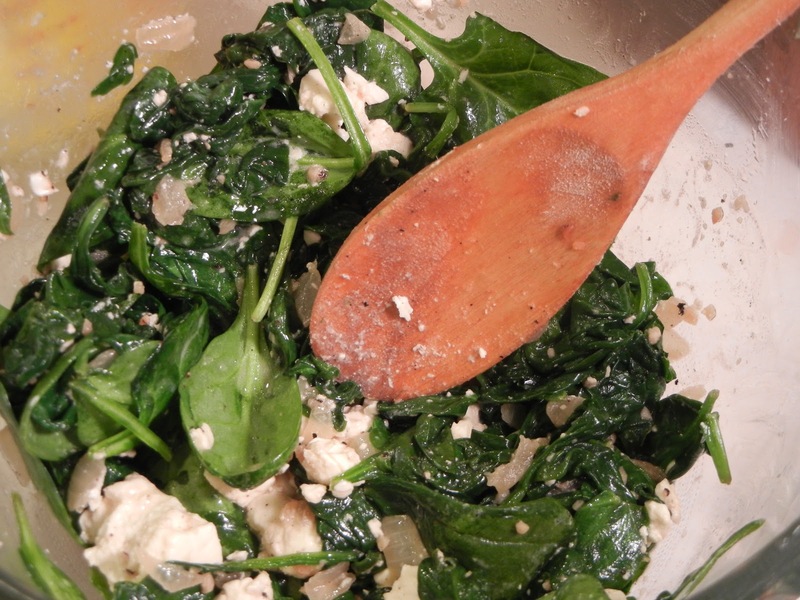 Slightly chop spinach mixture and add to your egg mixture. Mix. 1. Brush your pie pan with butter. 2. Lay 1 sheet of phyllo face down on a flat surface and brush lightly with the melted butter working from the edges towards the middle. Lay 2 or more down(depending on your liking or how thick you would like your spanikopita) brushing between each layer. 3. Drape buttered pastry dough over the pie pan and press into place. 4. Add spinach layer. 5. Repeat steps 1-4 till you have 3 layers or more layers. 6. Bake until golden, 20-25 minutes. Let spanikopita rest for 5 minutes after removal from oven. 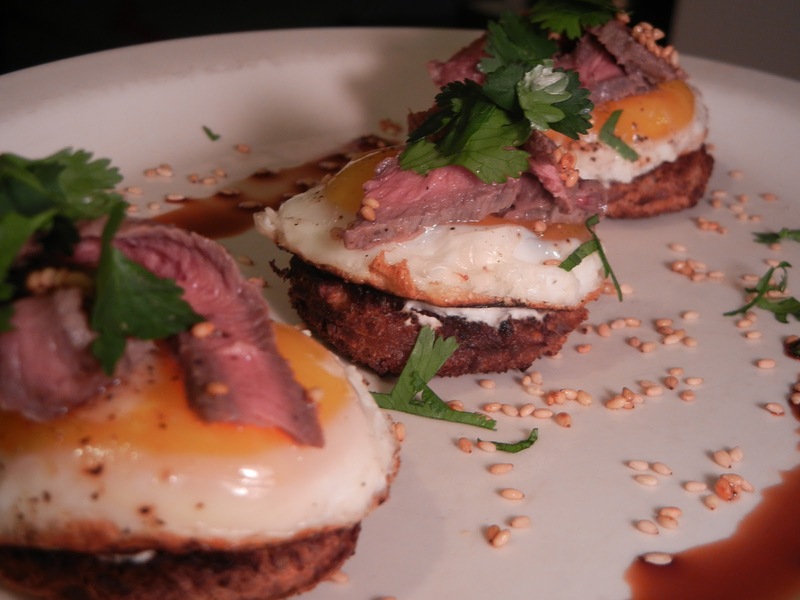 Toasted rounds of bread with Greek yogurt, egg, hanger steak, cilantro and toasted sesame seeds. Absolutely one of my favorite snacks or meals to eat. Very quick to throw together and bursting with flavors that are sure to make the ol’ taste buds jitter. Can also add julienned roasted peppers, capers, fatback or whatever you choose. I mean really..what doesn’t go good with an egg?